Home » Security Products » Deadlocks, Deadlatches and Deadbolts – What’s the Difference? So we decided to create a post to explain the differences between each locking device. 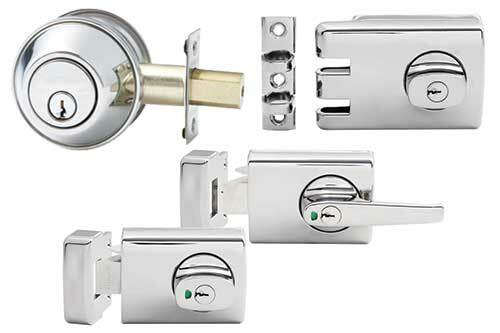 Also Australia’s own Lockwood has a range of locks in each category. On one side of the lock is a keyhole and on the other is another keyhole and turnable knob. When in deadlock mode the knob is inoperable. This is to increase security and prevent thieves who gain entry via a window for instance being able to escape via a deadlocked door. While deadlocks are great to provide a high level of security care must be taken to not leave them in deadlock mode when you are at home. Otherwise in an emergency, such as a fire, you could be trapped inside if you don’t have the key with you. Fortunately Lockwood’s Deadlock and other brands overcome this. When not in the deadlock mode you are able to use the handle to unlock and open the door from the inside. This type of locking mechanism is popular in both commercial and residential properties to provide high levels of security. Deadbolts have the same functionality as a deadlock. As can be seen in the images, typically the locking bolt extends out of the lock allowing it to go into a wall to secure the door. As this puts a single metal bolt from the door into the wall it makes forcing the door open almost impossible when a deadbolt is locked. 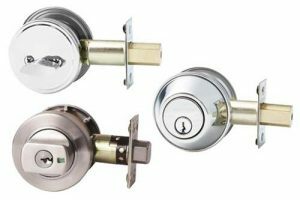 Lockwood has various types of Deadbolts, each with their own set of features. As with deadlocks a deadbolt that is in deadlock mode can only be opened with a key even if it has a handle. As such care needs to be taken to not deadlock people inside a building in case of emergency. With the increase in security that these locks offer, deadlocks and deadbolts are a very common feature in many homes and commercial properties today. These types of locks can be used on their own, however are often alongside a regular latching lock. When used in conjunction with another lock, a deadbolt is usually placed above the door handle. A deadlatch takes the benefits of a deadlock and add a latching function. While a deadlock either needs a key to lock the door, or to turn a knob to move the bolt into lock mode. A deadlatch will automatically lock itself whenever the door is closed. This makes leaving the house quicker and you can be safe knowing the door is locked behind you. Passage Mode: The latch is locked in the open position allowing the door to open and close freely. Safety Mode: The latch and the rear handle are active. This allows the door to lock when the door is closed requiring a key to open the door from the inside. Or the rear handle can open the door from the inside. Secure Mode: This is essentially the deadlock mode. The latch is free to move so the door can be pulled close and will lock. Then the only way to get open the door from inside or outside is with a key. As mentioned having an active deadlock on your front door is a great way to ensure that intruders cannot simply open the front door from inside allowing them to steal large objects easily. But you don’t want to have a deadlock active on your front door when you or anyone else is home. 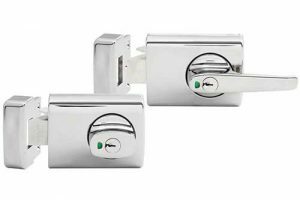 Fortunately the latest models of deadlatches, such as the Lockwood 001, come equipped with anti-deadlock devices. This means that when you unlock the deadlocked door from the outside, the deadlatch mechanism from the other side of the door is also automatically unlocked. Thus preventing someone getting deadlocked in once they get home. 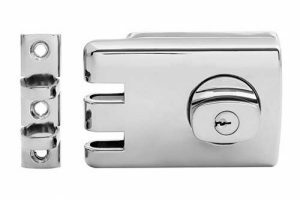 Today, most insurance companies require you to have one of these “dead” locking types of mechanisms installed on your doors and windows for you to benefit from full insurance cover. The reason for this is that these types of locks offer greater security and are not easy to pick. This means that burglars cannot easily leave your home with larger items in the unfortunate event of a burglary. Staying safe and secure in Sydney is vital, no matter where you live. Ensure your properties locking devices are up to date by requesting a free security inspection. 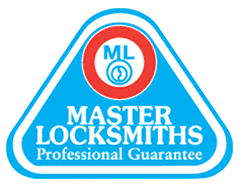 We only use and recommend the best lock brands in Australia to ensure you get quality products. Also our workmanship is backed by a full 18 month guarantee. 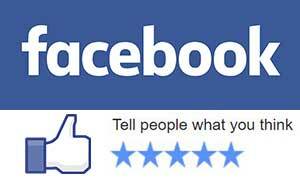 Join the long list of our satisfied customers and give Fusion Locksmiths a call today.